A cootie catcher is full of carefully-folded dichotomies. It’s centuries-old origami performed by kids (usually), many of whom live far away from the device’s country of origin. Delicate in its construction, but usually (in my experience) scrawled over with crayons or colored pencils with clunky renderings. Full of secrets, mysteries, and fates, all of which your friend just wrote right in front of you. It’s a playground pastime for the inactive mystics and gossips of school, or a way to pass the time in class. The cootie catching practice has endured through the years, though individual ones never did. They were pocketed by those who got what they wanted and wished to preserve it, those who didn’t and wished to conceal it. Left on a desk, trashed, or left behind for someone else to ponder what it all means. If you were unlucky enough to never encounter a cootie catcher, let’s back things up to the beginning. The fortune teller also goes by chatterbox, whirlybird, or salt cellar, and that last name is actually reflective of how the origami figure was first introduced to the United States. The 1928 book Fun with Paper Folding contained the “salt cellar,” which, when inverted from how we’re used to seeing it today, was meant to invoke a container that could hold and pour salt. The points of a cootie catcher become legs and the spaces for fingers open up to hold the salt. The exact lineage and timeline for the introduction of the cootie catcher around the world is somewhat murky. Most sources suggest it’s possible that it appeared in Europe as early as the 17th century. It’s safe to say though that by the 1950s, cootie catchers had started to appear in England and the United States, and propagated from there. Today, the game is played all over the world, and each place has its own name for the fortune teller. For first timers or those in need of a refresher course, here’s how to make your own cootie catcher, just in time for back to school. 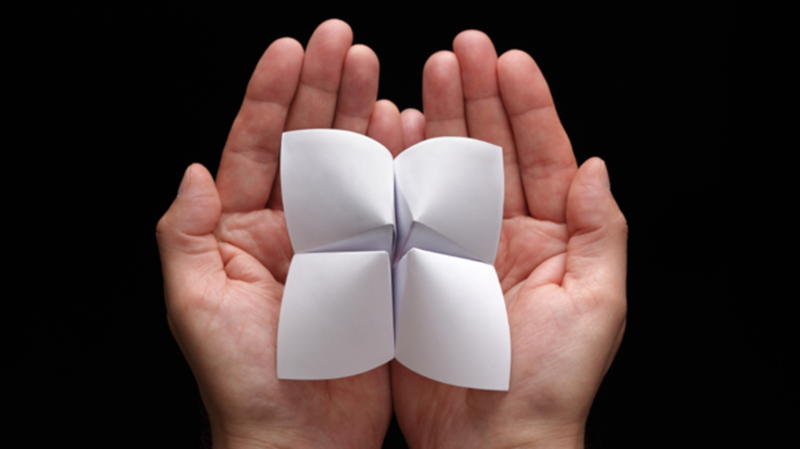 Once the cootie catcher is built, you can use it both for grabbing cooties off of your friend (without worry of infecting yourself), then fill it with messages and use it to tell fortunes (that’s versatility!). When you’re ready to use it, the fortune teller prompts their subject with a series of choices from the catcher (usually in the form of colors, numbers, or pictures) that will lead to one of the eight flaps inside, each concealing a message. There are plenty of other videos out there on the internet that go into more detail if you need some assistance with your prescience.